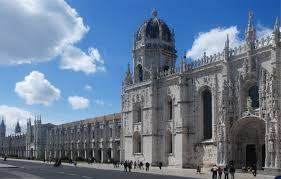 Not far from the wonderfully ornate Belem Tower is the Jeronimos Monastery. Both are magnificent examples of the late Gothic Manueline-style and UNESCO world heritage sites. As is often the case with such structures, maintenance and preservation are a constant worry. Scaffolding may be a photographer's nemesis, but for the sake of future generations it is a necessity. Fortunately, I found a photo online without the scaffolding. 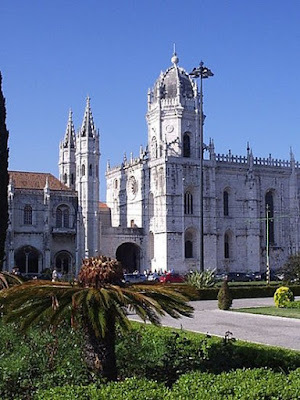 Construction of the monastery began in 1501 under King Manuel (hence the name of this late gothic style of architecture) and was completed 100 years later. The decorative stonework is second to none. Detailed. Intricate. Almost gaudy as the eye has trouble deciding where to focus - each carving is akin to eye candy! Anyone of these statues that adorn the side entrance could easily be set aside and put on display on its own merit. This truly is sensory overload. Moving inside to the cloisters does not lesson the experience. The mind continues to boggle. We oohed and aahed with every step! I constantly had to remind myself the lace like patterns on the arches are created in stone yet even that didn't quite register. Almost ever square inch of the stonework is decorated. I cannot imagine the total number of man-hours put in by the stonemasons. I could easily have spent hours strolling the cloisters. Depending on which side of the quadrangle I was in and the angle of sunlight each walkway offered a different view, a unique detail, a new perspective, AND a wonderful sense of calm. This fountain tucked in one of the corners seemed almost plain in comparison to other details nearby, yet still provided a perfect photo op. This next photo is a close up of the intricate stonework and if you look carefully you can see the lion fountain tucked in the corner under the large arch. The thickness of the walls is evident in this next shot. The double doors lead to an annex where one of Portugal's greatest historians is honoured. While John dutifully read each sign in the annex I returned to admire the cloisters. The upper level is as stunning as the lower with floral and decorative detailing. The size of the refectory (monastery dining room) gives some idea of the number of monks that must have once inhabited this monastery. That's John at the far end, walking toward the camera. The tile work that surrounds the refectory is richly detailed and as much a work of art as the paintings that hang at either end. For 500 years the Saint Jerome Monastery has impressed peasants, pilgrims, and monarchs alike and it is by far one of the highlights of our European adventure.